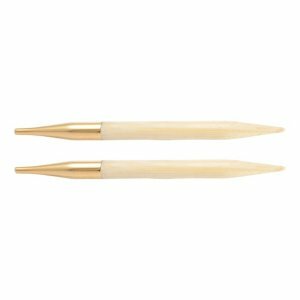 These interchangeable needle tips from Knitter's Pride are manufactured using high-quality Japanese bamboo and the connectors are plated with 24 Karat gold! Lightweight, yet strong and durable, these tips feature perfectly tapered points with a smooth finish for hours of enjoyable knitting! Knitter's Pride Nova Platina Interchangeable Needle Tips Needles is a similar needle: n/a, interchangeable tips, and US 9 (5.5mm) US size. You may also like Knitter's Pride Zing Special Interchangeable Needle Tips Needles, which is another similar needle: interchangeable tips and us 9 (5.5mm) us size. Knitter's Pride Nova Platina Interchangeable Needle Tips Needles From $6.23 to $8.90Select options on sale now!